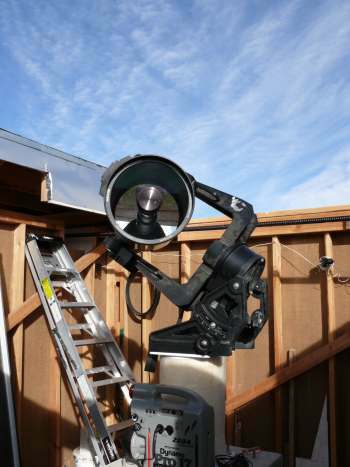 My aim on this visit was to install the roof-opening mechanism on the observatory together with Gene's 12-inch telescope. I managed to do this and to use the telescope on the last night. Cable TV was also installed during my visit so this is available for visitors to use. I also wanted to get the building and telescope operating remotely so that I could use it from the UK. Unfortunately, the cable TV and broadband connection share the same line which means the router is at Valley Telecom rather than in the house. This prevented me from making the changes needed to allow remote desktop and I didn't have time to sort it out with Valley. Hopefully we'll get this done next time. 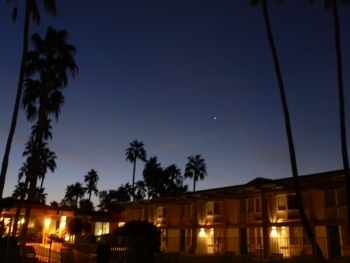 I took the usual BA flight to Phoenix but instead of staying near the airport I stayed at the Days Inn in Scotsdale. This is one of the options that BA were doing a special offer on and I wanted to see what Scotsdale was like. Scotsdale looked interesting as I drove to the hotel which is within walking distance of the old town with its quaint shops and art galleries. Being too tired to explore I had an early night, planning to get up early next day to visit the mall which is next door to the hotel. 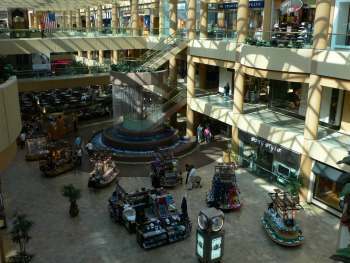 After breakfast at Days Inn I walked across to the mall and had a good look round. The shops didn't open until 10 a.m. although lots of eating places were serving breakfast. Not wanting to hang around I decided to visit the shops on my way back and set off for the ASV. David Churchill doesn't have a house at the ASV but has installed twin telescopes on his plot of land. He operates these remotely and visits them occasionally. The horses in the foreground are often around the village; they don't belong there but their owners seem incapable of keeping them fenced in and they enhance the scenery. 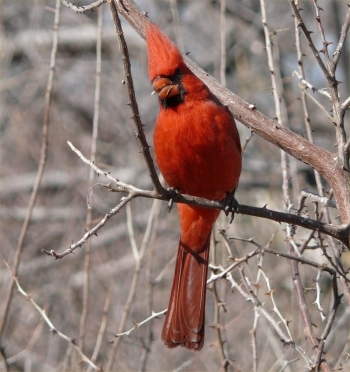 In winter the birds seem bolder when looking for food and this cardinal posed close by as I sat in David Jasper's feeding station. Lack of foliage on the trees makes this a good time to take photos of winter residents and visitors. These little guys take advantage of the food dropped from the bird feeders and are fun to watch. For a long time I wasn't sure if they were chipmunks so checked up before writing this report. 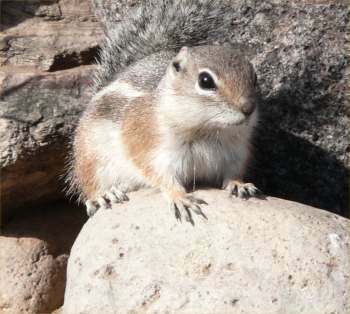 From what I can tell the chipmunk is a very similar size but has more pronounced markings on its face and back. Also, they seem to trail their tails behind them whereas this chap and his friends held their tails over their backs in traditional squirrel style. I hope I've got this right. One of the reasons for the visit was to see Rancho Hidalgo, a new development just a few miles away from the ASV that was in its early planning stage. Gene suggested we see it from the air first. 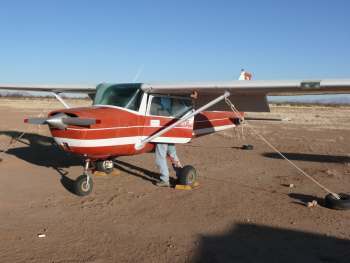 He has a two-seat Cessna 150 which he's learning to fly. He's quite close to qualifying but doesn't yet have his licence, so I was pilot-in-command although he handled the controls. He proved to be a very safe and competent pilot and took me over Rancho Hidalgo then across to the area around Horseshoe Canyon in the Chiricahuas to look at other options for trail riding. Rancho Hidlago will be developed along similar lines to the Arizona Sky Village with the addition of an equestrian centre and vineyard. 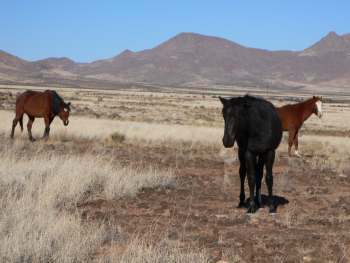 It's located alongside the Peloncillo Mountains in New Mexico which provide endless opportunities for riders of all levels. The next day Gene and I met a prospective purchaser at Rancho Hidlago and I got my first view from the ground. The customer is a keen astronomer and his wife is a keen horsewoman. When the horses wandered over to greet us he was convinced that this would be the ideal place for a holiday home. He's since purchased several plots with a view to moving there. Later I returned by myself to take some more photos and explore further. Close to the Animas Road there is a substantial lake created behind an artificial damn. Originally it was for irrigation but now makes a superb setting for wildlife. As I approached it these geese took flight and circled the lake getting higher and higher before heading east and out of sight. Sitting quietly by the lake I awaited their return and enjoyed the company of many small birds that moved around in tiny flocks. 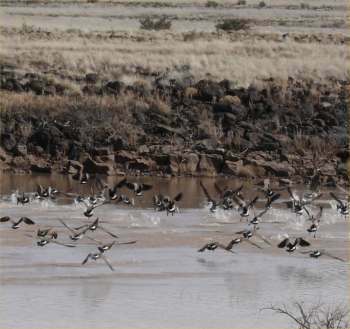 The return of the geese was announced by the same raucous noise they had made when leaving. Losing height like airliners in a stack at Heathrow they circled until they were happy there was no danger then landed in a part of the lake I couldn't see. Later I discovered there is a sand bank on which most of them were standing. There were spent shotgun cartridges on the damn which might explain why they flew off so readily. 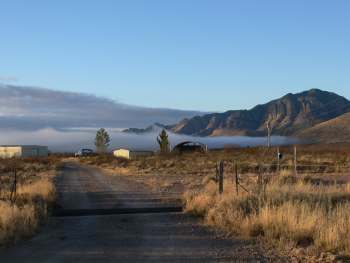 Gene and I had arranged for a more extensive tour of Rancho Hidlago and set out early one morning, only to discover thick fog running along the Arizona/New Mexico border. It proved to be very dense making driving difficult and we were still in it when we arrived at the ranch. It wasn't very deep by then and blue sky was visible above. Horizontal visibility was about 30m but improving. Our tour of the ranch took us to the two houses that already exist there. One is occupied by a care-taker who looks after the horses and generally keeps an eye on the place. The other is a substantial ranch house with numerous outbuildings; it's empty at present. We drove to the edge of the foothills and it's clear there is wonderful riding country here which will suit anyone from novice to expert trail rider. Rancho Hidlago adjoins federal land in the Peloncillos that has open access so there are thousands of acres to explore. 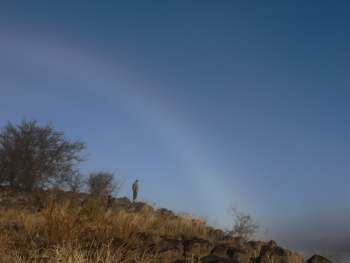 They include the sites of ancient indian settlements, many of them unexplored. Every time I visit the Sky Village I find something new and completely unexpected; this visit was no exception. Mary Cragg is an accomplished harpist who has performed in front of Queen Elizabeth II. 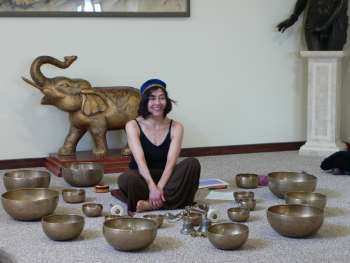 I discovered that she was teaming up with another lady to give a Harp and Tibetan Singing Bowl Recital, to be held in John McAfee's yoga studio. This turned out to be an interesting and enjoyable experience but I never expected to find myself in an audience of cowboys, in the desert, listening to a Harp accompanied by Tibetan Singing Bowls and surrounded by a priceless art collection. When we visited the new heath food store downstairs then emerged into the bright afternoon sunshine we wondered if it had all been a dream. Quite a lot of the time on this visit was spent working on the observatory with the two main objectives of motorising the roof and installing the telescope. The garage door opener I was using required an extension to give the required travel, and the extension, which protruded through the end wall, had to be protected from the weather. I rarely get the chance to do any work like this at home so was a bit rusty but found the work enjoyable and was really getting into the swing of it by the end of the trip. The roof now rolls back and closes at the touch of a button. 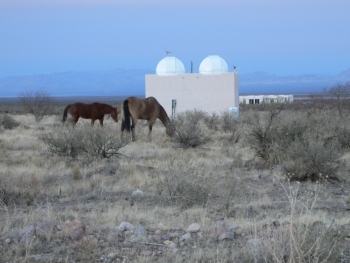 The telescope is installed and available for use. When I left we hadn't located Gene's diagonal so used the telescope in straight-through mode. I had hoped to prepare the way for remote operation but hit a snag with opening up the laptop for remote desktop. Cable TV was installed during the visit and it turns out that instead of having a modem/router in the house we have a bridge with the router at Valley Telecom's end. This means they have to open the port that will allow remote desktop and I didn't have time to go through this with them. They seem very helpful so I'm hoping this won't prove a show stopper. I don't want to have to install a second phone line to get around this problem. All too soon it was time to leave for home and I left early on the last day to visit Scotsdale. My wife Lucy says I should place more emphasis on the shopping as it is of more interest to most ladies than astronomy. So I did my duty and spent most of a day in Scotsdale checking out the malls and the shops in the High Street. It's a very pleasent place to visit if you like shops and art galleries. Some of the art on display is excellent. Despite my antipathy towards shopping I have to admit to enjoying browsing in Scotsdale. There was a lot of excitement in Phoenix because the Superbowl was to be held there the following weekend. Reading about the stadium over lunch I decided to make a detour on the way to the airport to have a look. The stadium is enormous and fully air-conditioned. The playing surface is grass growing in a giant tray filled with soil about a metre deep. Not only that, the whole tray is on wheels so the pitch can be rolled out of the stadium to make way for other uses. It could only happen in America where they have the space to park a spare pitch while it's not in use. The BA flight back to Heathrow was comfortable and uneventful. I had spent the night before the trip at the Master Robert Hotel which offers up to two week's free parking if you stay there for a single night. Their taxi collected me from the airport and I soon retrieved my car and headed for home.